Previously I have written about three betting systems that will make money from the sports betting markets in the long run. There is Matched Betting, Value Betting and Arbitrage. Rebelbetting is a piece of software which focuses on the arbitrage. Here are the contents of my Rebelbetting review. Is Rebelbetting easy to use? How much money can I make with Rebelbetting? Rebelbetting was established in 2008. It has been one of the most popular arbitrage software providers since its inception. The company is based in Sweden and has been used by over 100,000 customers. The software currently supports 76 bookmakers. It highlights arbitrage opportunities in tennis, football, basketball, American football, hockey, rugby, Aussie rules, baseball and horse racing. Your first question might be what the hell is an arbitrage bet? An arbitrage bet is when you cover all outcomes of an event. Which then guarantees you a profit at the end of it. Rebelbetting flagged up an arbitrage opportunity. On the Leopardstown race at 17.05. A horse called Daliyah was priced at 3.25 on Paddypower. This horse was available to lay on the betting exchanges at an 2.88. I took the available money at Smarkets. Which was just less then £50. In standard arbitrage a profit is made on all outcomes. In this situation an 11.3% profit could be made backing at 3.25 and laying at 2.88. You can see from the above. That rather then hedge the profit on all outcomes. 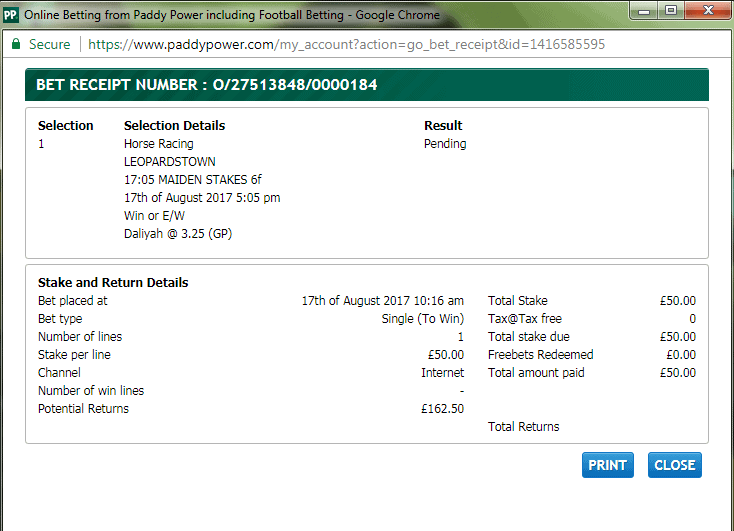 I have weighted the profit on the horse Daliyah winning. This is a personal preference of mine. I could have also guaranteed myself a profit across all outcomes. Having all profit on one outcome of the arbitrage bet is known as value arbing. Lets look at what happens should Daliyah win the race. If Daliyah should lose the race. From this example you can see that the odds are stacked heavily in your favour. Using arbitrage but leaving the value of the side of the soft bookmaker. Basically creating a very high value bet in this situation. Rebelbetting is very easy to use. The software constantly scans the odds on all the bookmakers it supports. When the software calculates an arbitrage opportunity. It highlights it for you so that you can investigate further. Once you select an arb. Rebelbetting will then automatically calculate a few other variables for you. You can see from the above picture that there is an arbitrage bet between Paddypower and Matchbook. 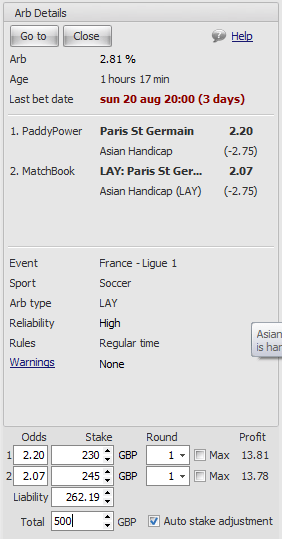 This is on the PSG vs Toulouse match, in the Asian handicap market. The software has highlighted a 2.8% arbitrage bet. From a stake of £492 it shows a profit of £13.81 or £13.78 could be made. You can adjust the stake figure to whatever figure you are using. Also the round option lets you round of your bet sizes. This is so that soft bookmakers are less likely to flag you as an arbitrage bettor. Rebelbetting is highly customizable and very easy to use. It has a lot features that allow you to find and bet on arbitrage opportunities as efficiently as possible. Initially you select which bookmakers you want arbitrage opportunities highlighted for. Define the minimum and maximum arbitrage percentage you are looking for. Which sports you want included and the length of time before it starts. 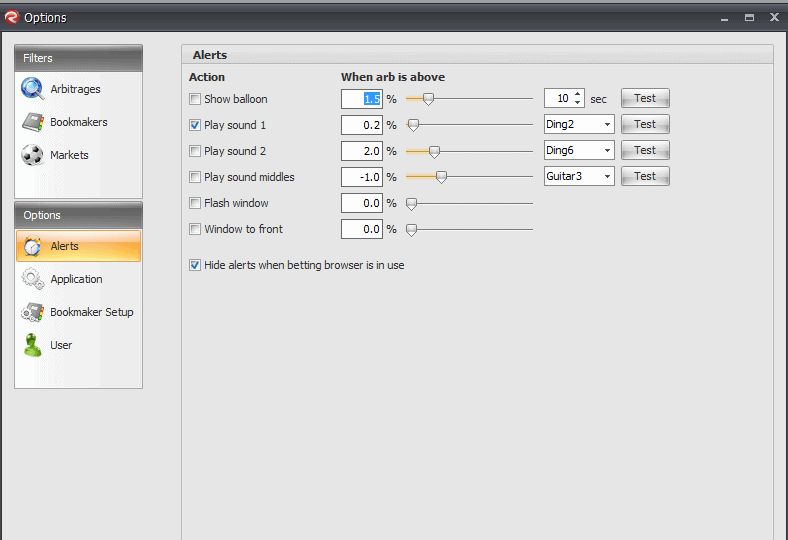 One cool feature is that you can set up specific alert sounds for different arbitrage percentages or middle bets. A feature that allows you to save a lot of time and process your bets as quick as possible. Is the in built browser, which automatically brings up the bookmakers where the arbitrage is available. You can save your username and password so that Rebelbetting automatically signs in to your account when you use this feature. Given that Rebelbetting covers 76 bookmakers there are a tonne of arbitrage opportunities. When I made all bookmakers available there were a total of 417 arbitrage bets available. There is obviously a good opportunity to profit from these. However it is unlikely that you will have access to all of these 76 bookmakers. Some of the bookmakers may be restricted due to your location. You can trial Rebelbetting for free and see how many you have access to. In terms of how much money you can make from arbitrage its going to differ from person to person. If you have access to a large number bookmaker accounts then its possible to make thousands of pounds from arbitrage betting. Personally I have made hundreds from arbitrage in the past. But I will admit that arbitrage isn’t my primary focus and is something I usually do once my accounts are promotion banned. I then like to go through these accounts over a few weeks and hammer them with arbitrage bets. A lot of matched bettors often discard accounts once the promotions stop. However arbitrage is a great way of milking them for every last ounce of a profit. Also some bookmaker accounts don’t offer much in the use of promotions. Again arbitrage is a good way to get use from these accounts. How Much Does A Rebelbetting Subscription Cost? There are several different pricing plans for Rebelbetting. The best plan would really depend on several different factors. What is your bankroll? How many bookmakers do you available? How much time do you have to commit to arbitrage betting? There is free trial version of Rebelbetting available. Which enables you to test the software out for free with a cap on arbitrage bets up to 1%. This will allow you to become familiar with the software. And see whether you would get value out of using the Rebelbetting service. Rebelbetting is a very professional product aimed at people that want to take their arbitrage betting to the next level. I highly recommend Rebelbetting. The service isn’t cheap but if you are interested in investing in sports arbitrage then you can’t go far wrong with Rebelbetting. For those of you that want to invest slight less on your arbitrage software. I would recommend you take at look at this service. Betting Tipster Reviews – Who Can You Trust?